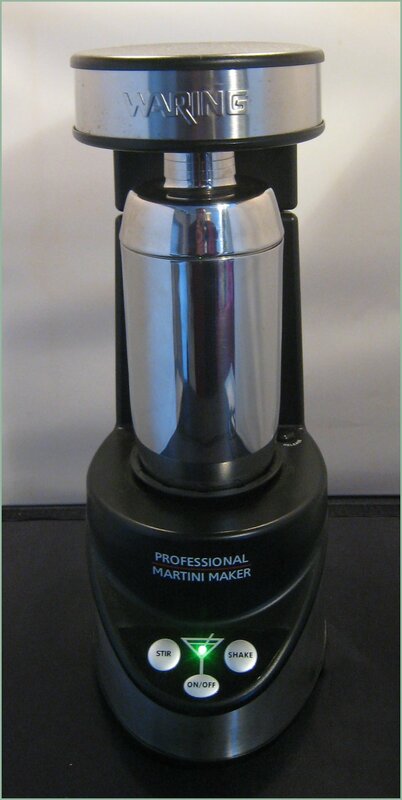 This was the first Martini Gadget that I owned, and I still think that it is the most impressive; it does have a tendency to wow! 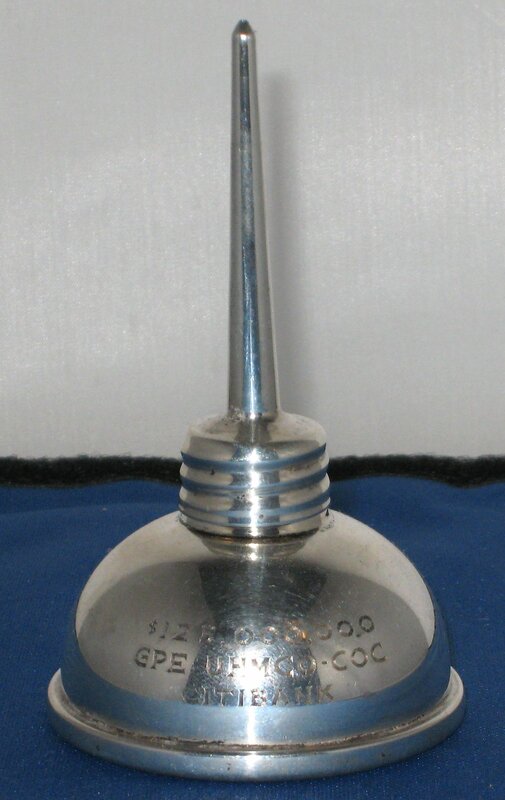 The Martini Spike was made by Gorham and consists of a silver-plated syringe that can be used to dispense tiny amounts of vermouth to your drink. It dates from the late 1950s during a boom-time of the cocktail hour, three Martinis and an affluent American Middle Class. It is from this period that most gadgets date and the syringe is representative of a growing preference for ever dryer Martinis. The spike came in a felt-lined box, complete with a rather minimalist pictorial instruction of how to use it. 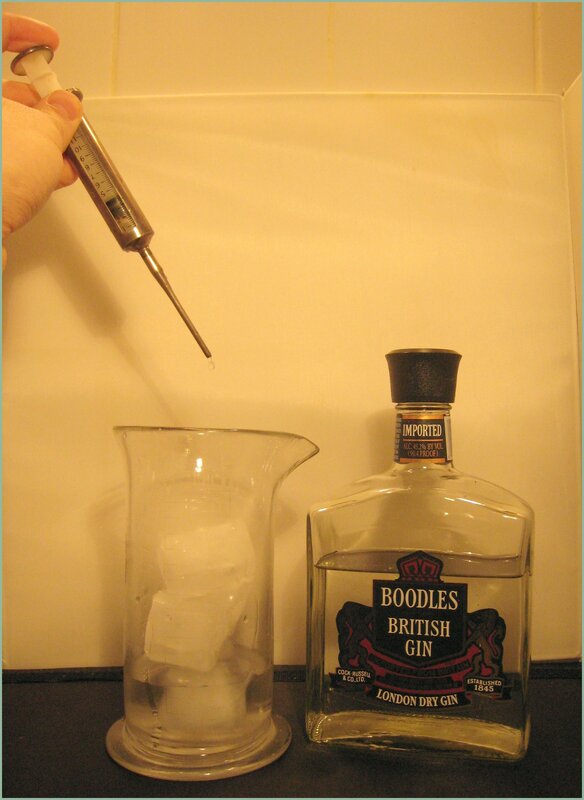 I used the Spike to add 5 notches (5ml) of Dry Vermouth to 30ml of Boodles Gin. These were added to an iced Martini glass, stirred and strained.The resulting drink was smooth, flavourful and quite powerful, too. Clean and crisp, it was a textbook Martini. The Spike was pretty easy to use and I quickly got the hang of it. A small dispenser is a useful tool to control how much vermouth you add to your drink. 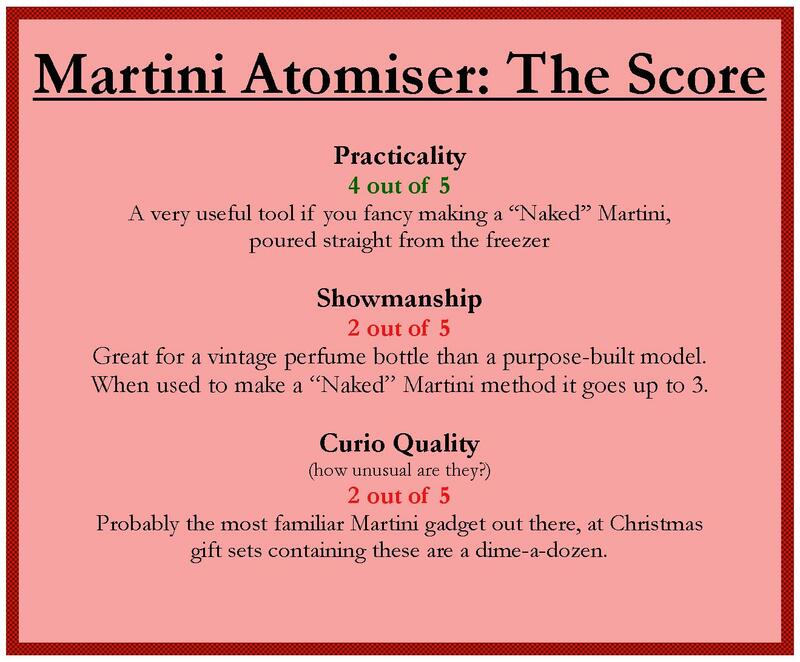 Each marking on the Spike represents one millimeter and so, with 30ml of Gin, you can make everything from 30:1 to 3:1; a fine range that should suit most Martini drinkers. 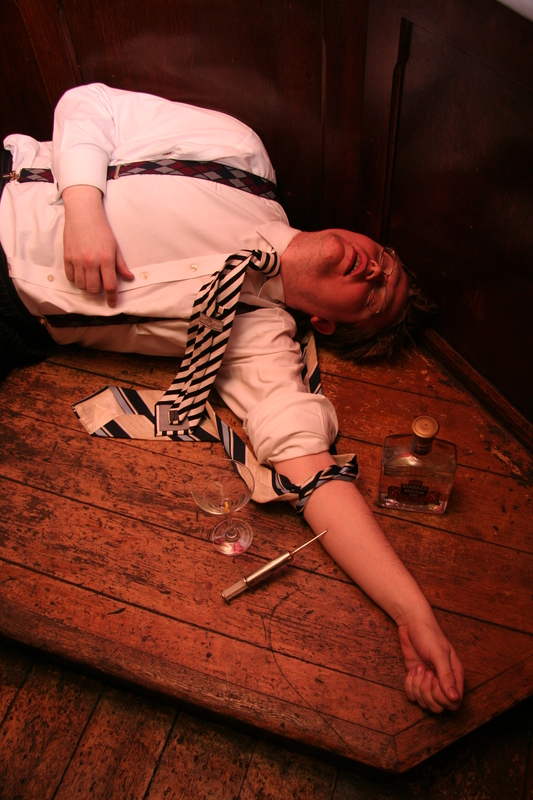 The potential theatrics of the Martini Spike are very high and I have already seen some used at a few events. It is something that will catch the eye of friends and patrons alike. No question, this is the most eye-catching Martini Gadget and very simple, too. 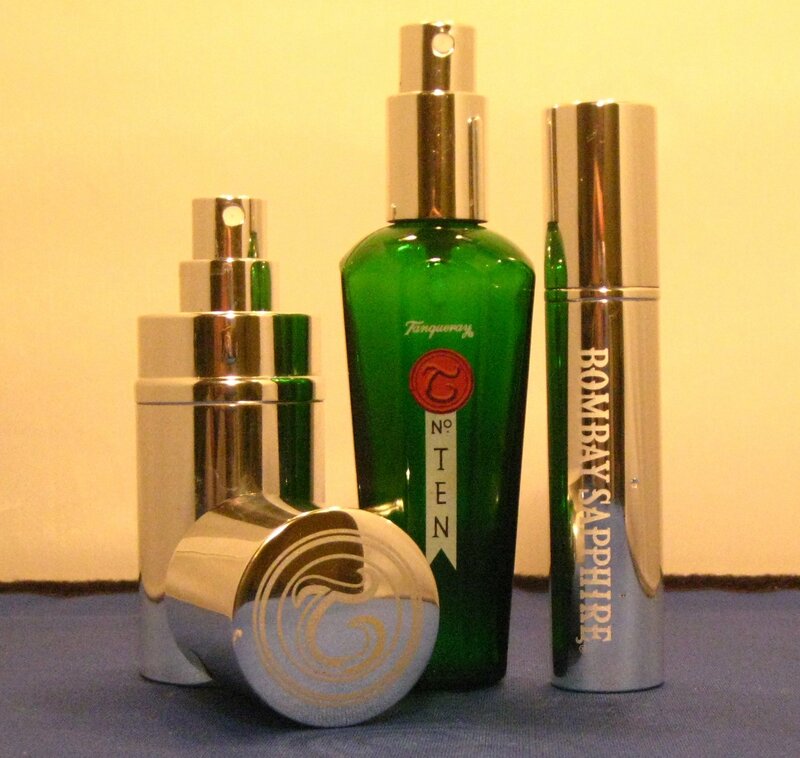 It’s medicinal nature and appearance give it a slightly sinister air; mystique and intrigue always appeal! 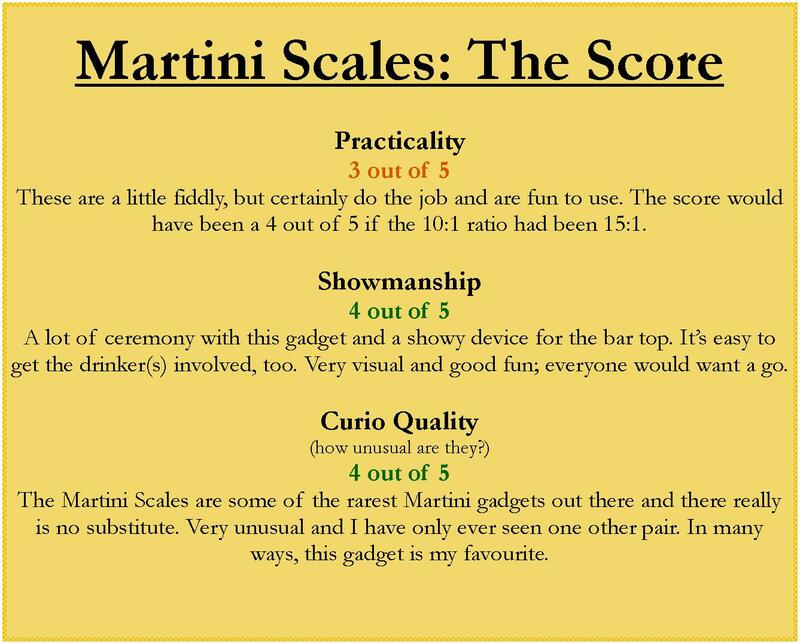 Martini Gadgets 9 – Martini Tester – How Dry is Yours? I first came about this gadget via a small pamphlet made by Gilbey’s Gin in the 1960s. The pamphlet states that, if you felt so inclined, you could send $2 to the supplied address and they would send you a tester of your own. I never actually thought that I would be able to get one of these, but now I have a few. 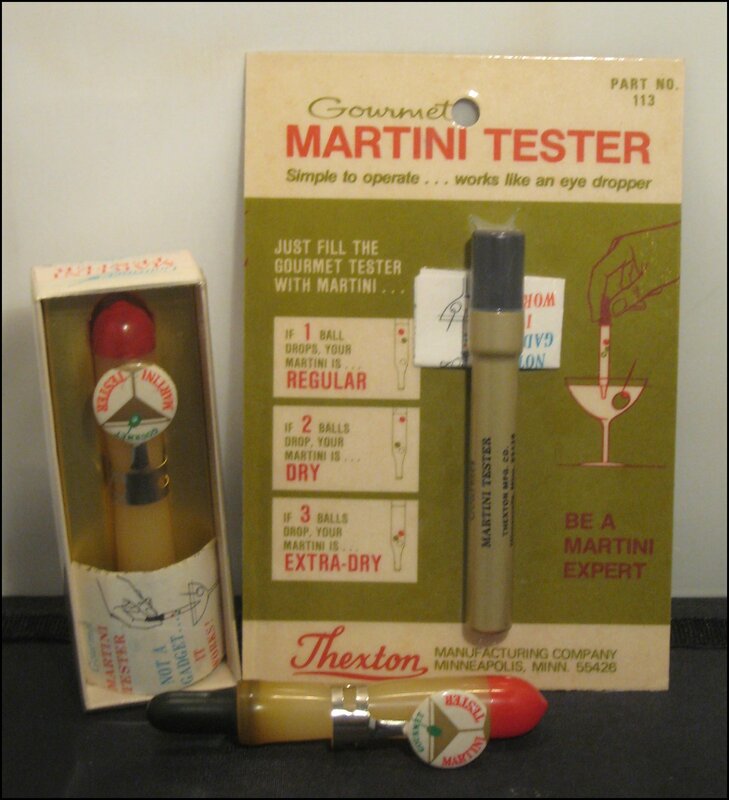 The Martini Tester is a small pipette with some coloured balls floating inside it. The idea behind it is that you use the pipette to sample your drink once it has been mixed and the relative positions of each of the coloured balls tell you how dry it is. I think it works on the principle of specific gravity, not unlike an anti-freeze tester. 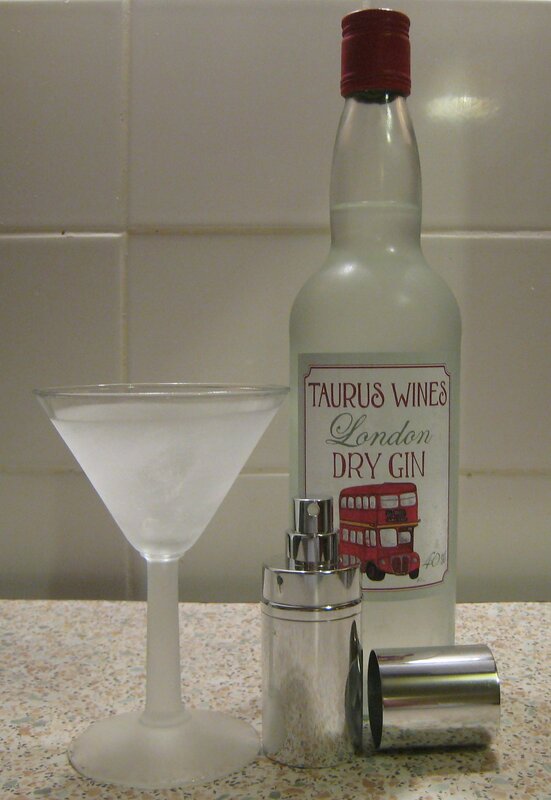 I decided to test it with three different Martinis and, in honour of the Ginstitute & Portobello Star (the only other place I have ever seen a tester like this), I decided to use their Gin. 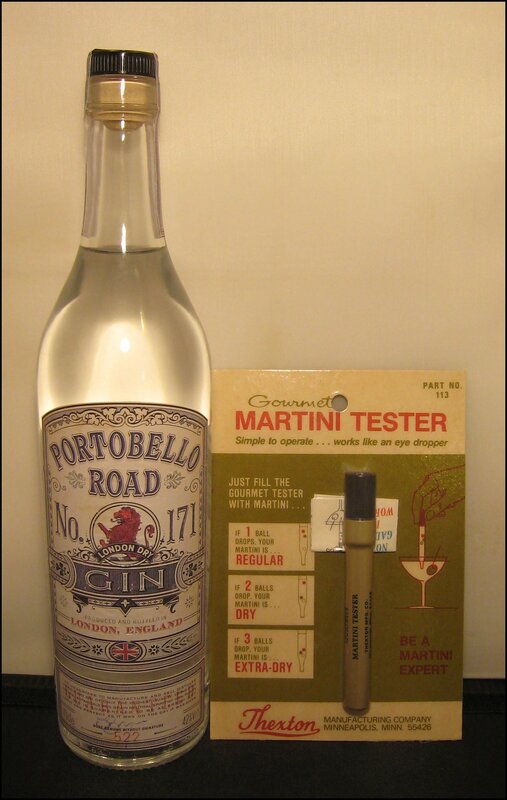 My Gin of choice for testing the Martini Tester is Portobello Road No:171 Gin (the Vermouth is Dolin Dry). This is a Gin created by the proprietors of the Portobello Star, a fine bar located at 171 Portobello road in London and home to London’s second smallest museum, The Ginstitute. It is bottled at 42%ABV and contains 9 botanicals, including Nutmeg. 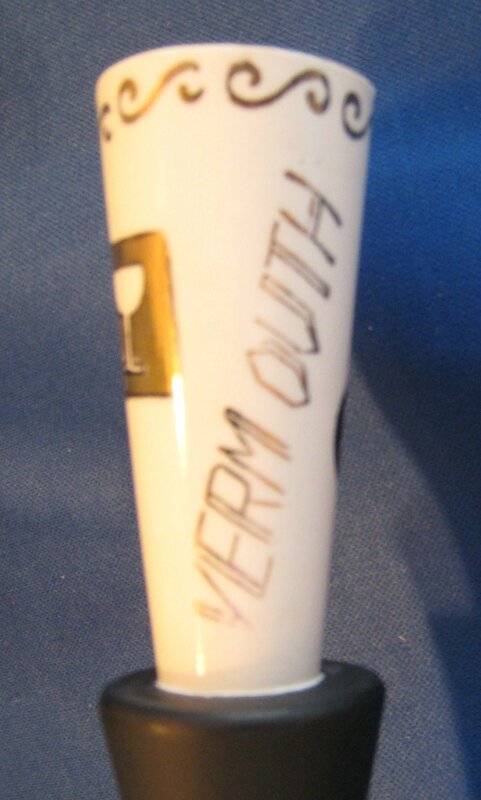 At 1.5:1 (30ml Gin – 20ml Vermouth), the tester returns a result of “Dry”. A sample from a glass of 100% Vermouth results in all of the coloured balls floating (a result of “Extra Wet”). 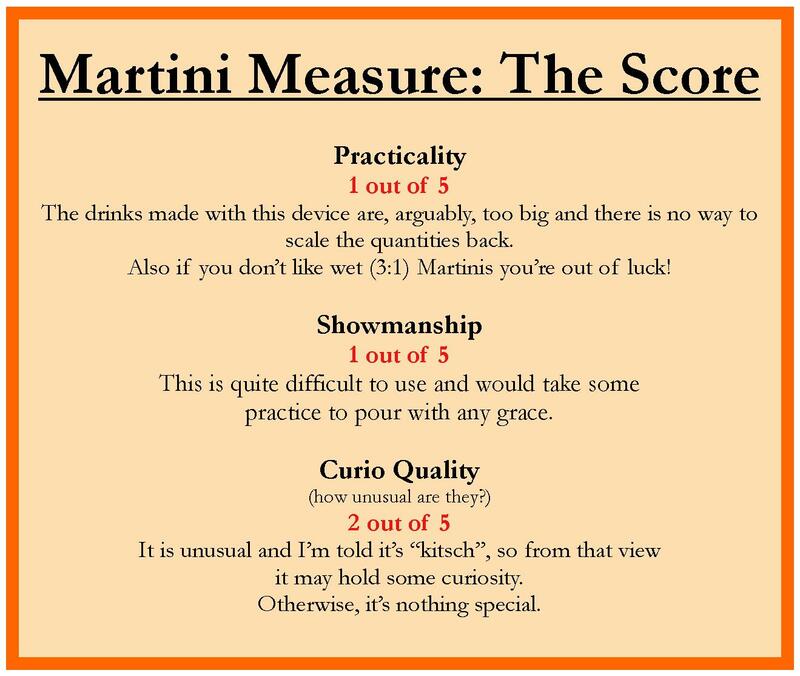 Given the fact that the tester only differentiates between super wet, wet and dry and that, today, a majority of Martinis are made at a ratio of between 3:1 and 10:1, its use as a tester is limited. In addition, unless you are out and about, why would you need to test your drink in this way anyway? 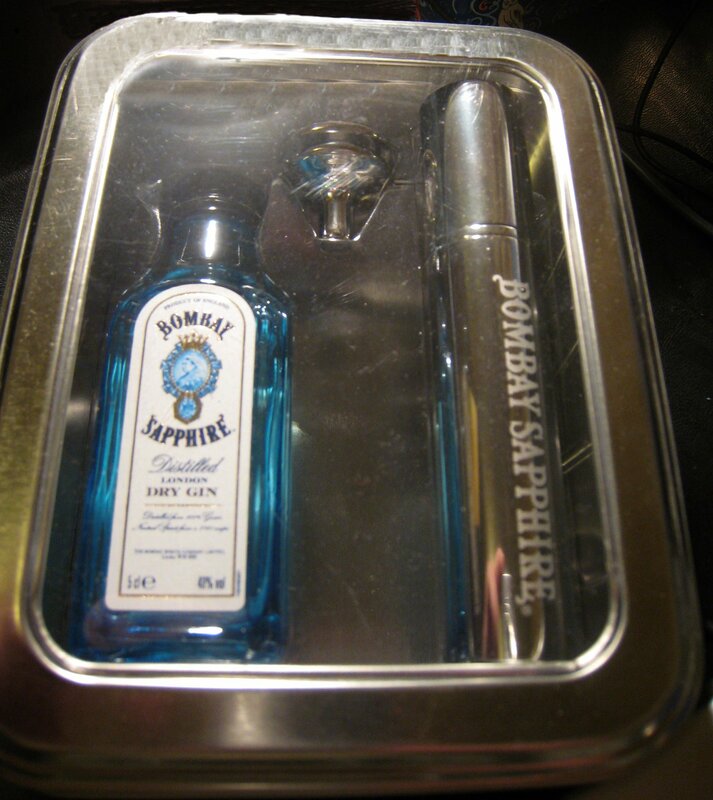 It’s also very fiddly to fill it with enough Martini to get a good reading. There is not a lot of showmanship with this gadget; any sort of testing is rarely glamorous and if you use it out and about, you risk looking like a fastidious fuss-pot. Very rare and unusual; I have only ever seen one other before. 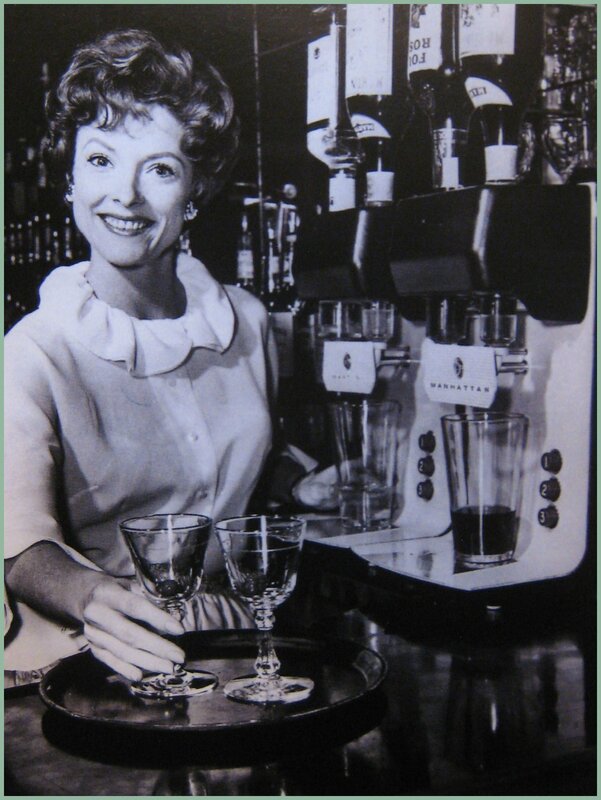 Automated Martini makers have been a round for a little while; the picture below is of the Cocktailmatic from 1961. 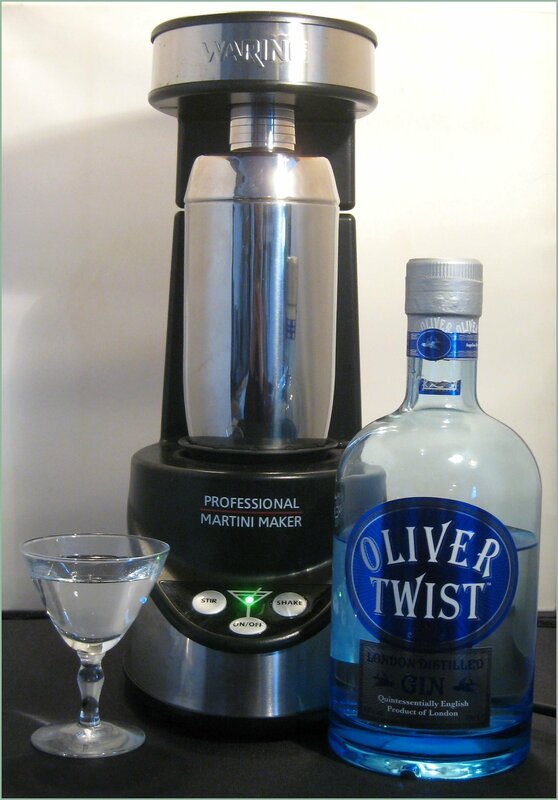 The Waring Professional Martini mixer has three buttons: on/off, stir and shake.The Mixer comes with a metal, three-part (or Manhattan) shaker, which fits into a little holder in the machine. This moves up and down when ‘shake’ is pressed and spins around when ‘stir’ is pressed. The on/off button activates/deactivates the device. The green LED activity light appears as an olive in a little martini glass logo, which is a nice touch. How well does it shake; how well does it stir? The little platform that the shaker rests in pulsates up and down for abut 40 seconds; press the buttons again for an extra long shake. As a result, the Martini is given a lot of “mini shakes”; hard shakers eat your heart out. Martini aficionados may notice from the picture that then drink is clear where as a shaken martini is usually cloudy. I can only think that the mix is not shaken with sufficient force to aerate or “bruise” the gin. Overall a very pleasant drink with an apparent lack of dilution, the gin really shines through, clean crisp and weighty. As both drinks are made in the stirrers, the drink is merely rotated rather than stirred; there is no paddle inside to stir the liquid, the shaker just rotates. I found the mixer very useful for drinks that need to be shaken for a long period of time, such as the Ramos Gin Fizz (9 minutes), but, beyond that, I have found it easier to get out my usual shaker and use a bit of elbow grease. The machine has some flair: the little LED lamp and its quirky, robotic movements are two attractions, but, as for you, the organ grinder, you just have to stand there and wait. This is very curious and no-one has come into our kitchen without commenting on it and asking to see it demonstrated. As it runs on the mains and is easily stocked (with ice and spirit), I’m usually happy to oblige. *I’m so glad it’s a professional one. 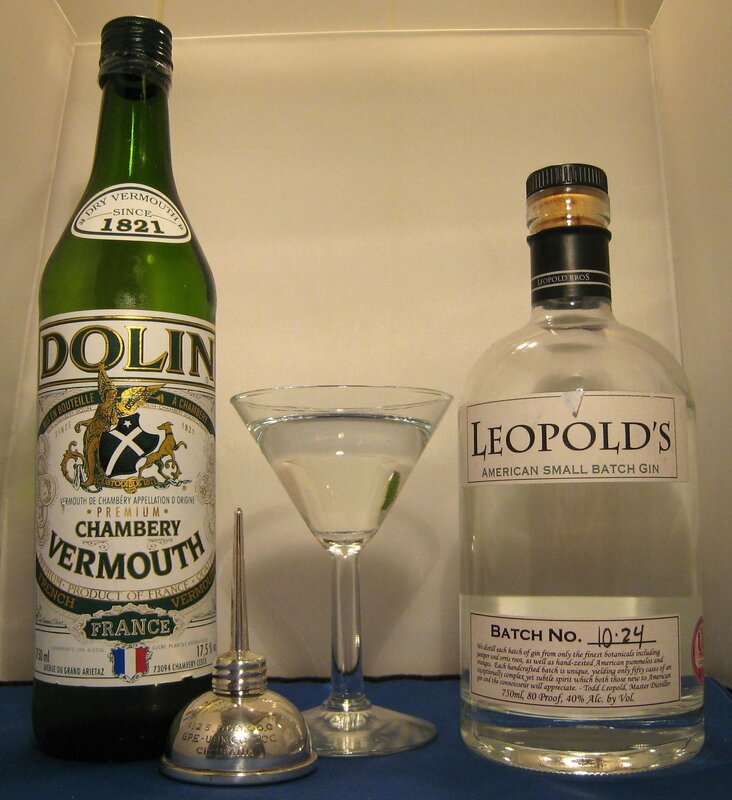 A Martini made with Heather Gin and Dolin Dry Vermouth according to proportion prescribed by the Martini Measure. The item itself consists of two china cones attached together by a piece of wood that is painted black. 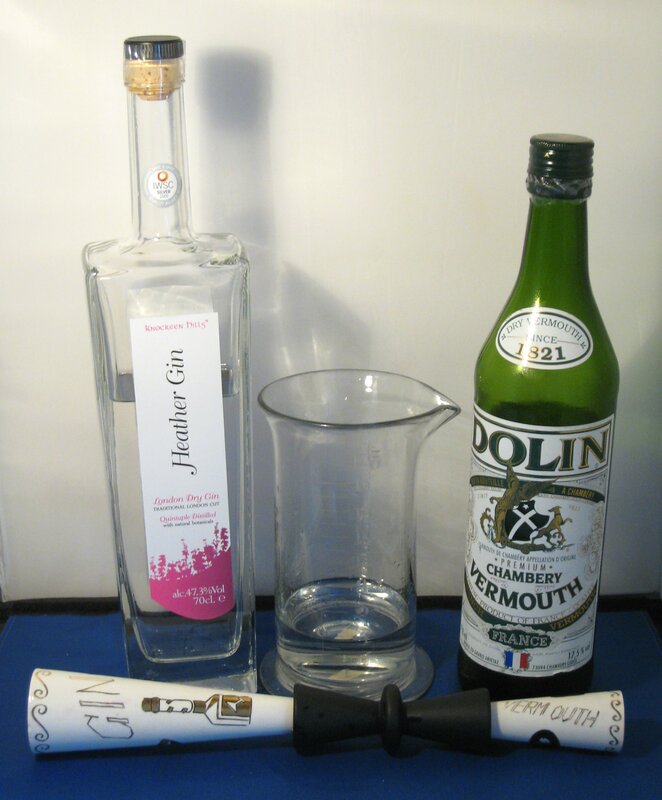 The large china cone is labelled “Gin” and the smaller, “Vermouth”; they hold 90ml and 30ml respectively. Thus, filling each to the brim would make a relatively wet 3:1 Martini. Each of the cones, or measures, are decorated with various little pictures. The gin measure has a picture of a bottle with a cocktail glass on it (I’m guessing that this is gin), in addition to a goblet and some juniper berries. The vermouth measure displays a fish on a plate and another goblet. Both measures also seem to be decorated with pictures of cheese. The drawings have an almost child-like quality, which makes me think that they were hand-painted. The box comes with no instructions, but I assume you simply use each of the cones to measure out the gin and vermouth and then add them to your mixing glass. 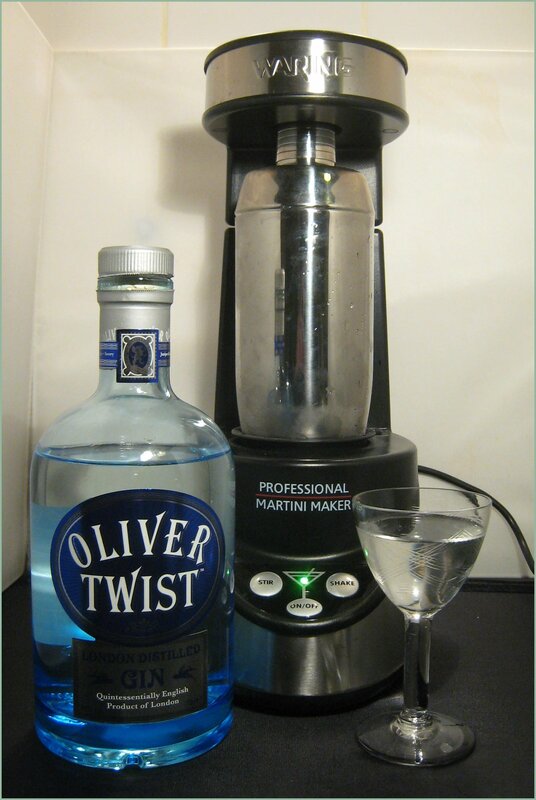 For my trial of this gadget, I used Knockeen Hills Heather Gin; at 47.3%, it makes a Martini with a lot of character. I accompanied this with Dolin Dry Vermouth. So far, we have looked at three methods for adding a minute amount of vermouth to your drinks, but what about having just the “right” amount of vermouth in your drink and ensuring that it is “balanced”? 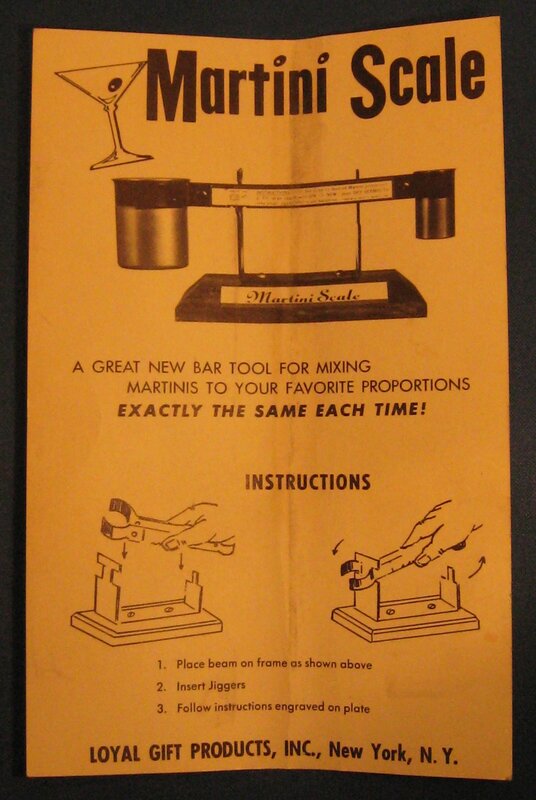 What better way to ensure this than to use the Martini Scales? 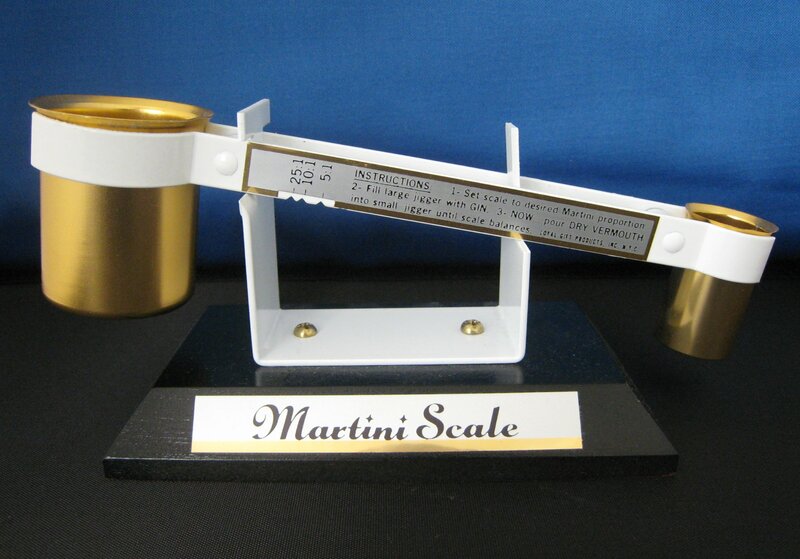 The Martini Scales were made by Loyal Gift Products Inc. of New York, N.Y. consist of two metal cups, one for gin and a smaller one for vermouth, that sit on each end of a see-saw arm, the pivot of which can then be moved up and down. The theory is that you pour vermouth into the small cup and then pour gin into the other until the scales balance. Moving the pivot adjusts the ratio at which the cups will balance; it’s all moments and turning points, but I’ll resist the urge to bore you with Physics. 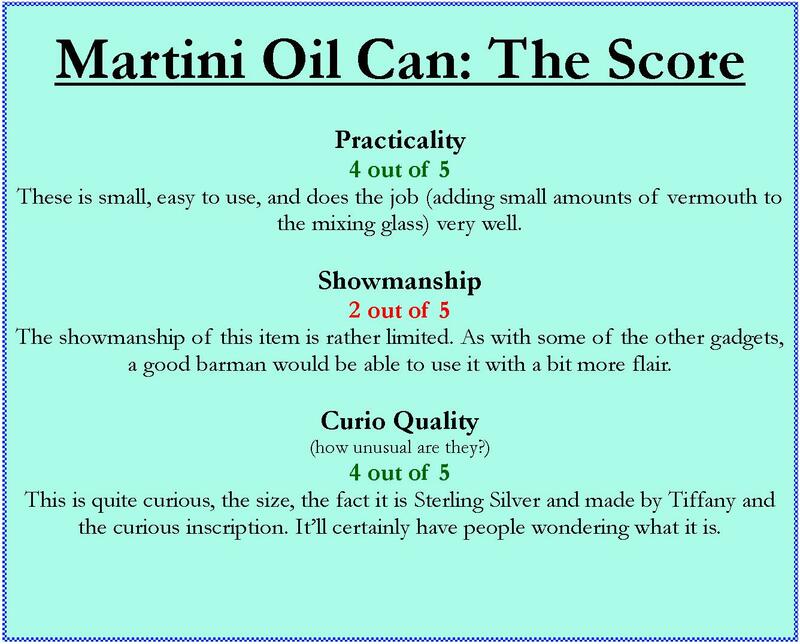 The scales come with three ratios marked out on the arm: 5:1, 10:1 and 25:1 (Gin:Vermouth); here are the tasting notes for each of these. For my test, I used Sipsmith Gin & Noilly Prat Vermouth. This was my personal favourite (I usually go for a 6:1 ratio, anyway): I found it to be smooth and rather well-balanced. This still seems quite wet (with a strong taste of vermouth); I thought that this would differ more to #1, but it surprisingly similar and still quite good. Very dry indeed; but then, at 25:1, that is what you would expect. Kudos to Nolly Prat, as the vermouth still comes through, but Sipsmith Gin can hold its own even if there was no vermouth. If you like your martinis dry, this is for you.